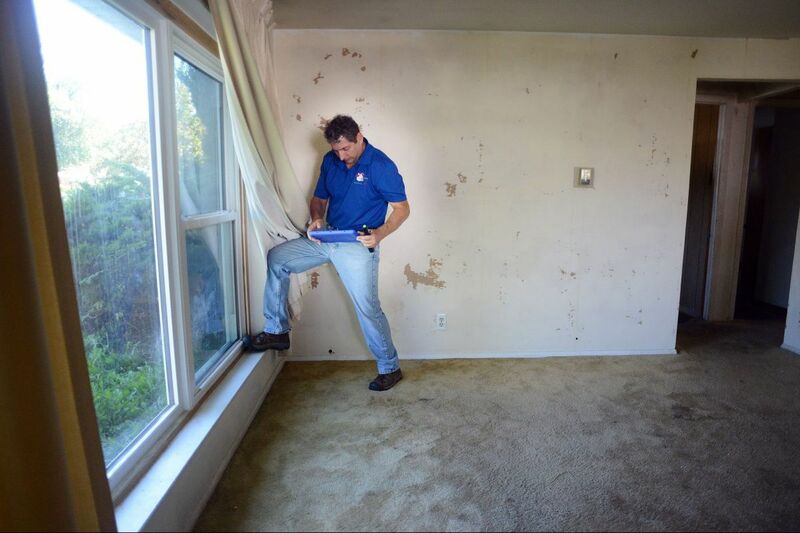 Home inspector Frank Castiglione of Real Estate Inspections looks at the living room of a home for possible problems. Buying a house can be difficult enough — especially in today's market. There are bidding wars to grapple with, a historically low number of houses on the market, and ample incidents of rejection for buyers who just can't get to homes quickly enough. Then, after a buyer finally snags that dream home, the process is far from over. Even after a seller accepts an offer, the sale is not a done deal until certain "contingencies" are met. Some are straightforward: Some buyers stipulate, for example, that a sale cannot proceed until they sell their current home. Other contingencies are more complicated. Either way, all are in place to protect buyers and sellers, allowing either to walk away from a deal if their conditions are not met. Navigating these contract conditions can be confusing. And in today's hot real estate market, where some buyers are waiving contingencies in order to win bidding wars, it can be difficult to determine which are important. These days, real estate agents say they have seen buyers waive inspection contingencies to make their offers more attractive. In doing so, buyers are forgoing their rights to an independent inspection, meaning they cannot ask the seller for repairs or walk away from a property if it turns out to be unsatisfactory. In short, buyers are accepting a house as is — and potentially, all of its hidden problems. To help buyers decide how important independent inspections are, the Inquirer spoke to real estate agents and inspectors about what goes into a home inspection, and whether waiving that condition is a good idea. In most typical real estate transactions, a home inspection is the next step that occurs after a bid is accepted. Buyers are responsible for hiring the inspector before the deal closes, and the process is in place to protect them. The inspector's job is to examine a home, determining whether there are problems with its exterior or interiors, from the foundation to the roof. The inspector provides a report to a buyer, who can then bring that information to a seller and use it back at the bargaining table. How quickly do I have to schedule one? "It depends on the contract and the state you're in," said Frank Lesh, executive director of the American Society of Home Inspectors. But typically, he added, buyers have five to 10 days after a home goes under contract. In Pennsylvania, the time period is stipulated by the state's standard agreement of sale document, which is used in most residential real estate transactions. That document says buyers have 10 days to complete the inspection, though it is possible to create a different timeline. In New Jersey, the standard New Jersey Realtors' sale document also specifies a 10-day window for an inspection, which is to begin after the buyers' and sellers' lawyers have signed off on the contract. Both parties can also change that timetable if it is agreed upon. Lesh's advice: Once a home is under contract, contact an inspector immediately. "Inspectors are busy, especially in hot markets," he said. "Some people tend to forget and wait until the last minute. You really only have a few days." How can I find a well-respected home inspector? Regulations for home inspectors differ across the United States. In New Jersey, inspectors are licensed and regulated by the state's Home Inspection Advisory Committee. To become certified, inspectors must, by law, complete 180 hours of study courses, including 40 hours of unpaid field work in the presence of a licensed inspector. Each inspector must pass a national exam, and complete continuing education every other year. In Pennsylvania, by contrast, home inspectors are not regulated by the state, and instead are required to be a "member in good standing of a national home inspection association," such as the American Society of Home Inspectors (ASHI) or the International Association of Certified Home Inspectors (interNACHI). Each association has its own requirements on certification and continuing education; for example, ASHI requires inspectors to pass the national exam and to complete 250 inspections to become certified. Continuing education is also required. Certified ASHI members can be found at http://www.homeinspector.org/HomeInspectors/Find. Certified interNACHI inspectors can be found at https://www.nachi.org/find-an-inspector. What does my home inspection cover? A general home inspection is a noninvasive exam of a seller's home. "The standards of practice are pretty uniform," said Pete Ciliberto, owner and chief inspector of Real Estate Inspections, a local inspection group. "We are covering all the major components and systems of a house — all of the structural elements, the foundation, exposed framing," and more. What that means: A general inspector will inspect the general structure of the roof, and the gutters and downspouts around it. He or she will make sure the home's "flashing" — the thin layer of waterproof material that prevents water from getting into where it does not belong — is correct. The heating and air conditioning systems are also inspected to ensure they are up to snuff. So are ceilings and floors, chimneys and vents. The ventilation of attics is inspected, and a generalized overview of electrical systems is completed. "There are probably over 200 things that we inspect," Lesh said. Many things are not included, local and national inspectors say. An inspection is not technically exhaustive, they pointed out, nor does it determine a property's suitability. Inspectors are not required to determine whether a building is up to code, and they are not required to move furniture, enter crawlspaces, or offer any services besides the inspection. Most important, the experts said, inspectors are not required to determine the presence of rodents or pests. They are not required to assess air quality or test for mold, mildew, or fungus. Airborne and environmental hazards are also excluded, meaning radon, lead paint and asbestos tests are not conducted in a general inspection. However, buyers can bring in specialists if they have particular concerns — or hire a general inspector who may be trained in a specialized area. "There are guys who do mold testing, air sampling, and other ancillary services," Lesh said. "If you want one person to take care of the whole thing, you can [find someone] to do that." Why should I get one — and should I waive that contingency? When making a financial decision as significant as purchasing a home, you want to confirm that you are making a wise investment. While inspections are not holistic, they offer a snapshot of a home's condition, and can give you fair warning of what repairs may be needed now or in the near future. Plus, agents point out, after an inspection report is issued, a buyer can use the report to ask a seller for repairs — or can walk away entirely. "They can ask for anything they want or can terminate for any reason — they do not have to say why," said Mike McCann, a real estate agent with Berkshire Hathaway HomeServices Fox & Roach. "The fall-through rate is only about 10 to 15 percent of the time, but I will tell you now, over 90 percent of the time, concessions are made after the inspections." McCann said he advises clients to never waive the inspection. "If they don't own the home, there are many things about it that they don't know yet. You can't check the roof. You can't see every joist. Having a professional go through that is very important."